The Survey Magnet now supports a new question type – net promoter score.This question can be used to ask attendees to rate your organization’s event on a scale from 1-10. A special calculation is used to calculate this score depending on how high or how low the rating is.This question is also supported on a mobile device. This new feature gives you the ability to showcase new exhibitor products to your attendees on the eventScribe Website and Mobile App. Additionally, you can use the product showcase feature in combination with sponsorship opportunities!The data for showcased products will be managed within the Expo Harvester, including hero images, supporting images, and additional documents for attendees to view. This feature allows you to quickly lookup accounts within the Mobile App.The “Search eventScribe Accounts” link has moved to the right-hand side of the app dashboard.Search for the user, see their account information, including the QR code to login to the Mobile App. This is particularly useful for an admin working the app support desk to provide a QR code for a user to scan on the app login screen. For mobile apps with integrations, you will soon be able to search accounts and receive results that will provide more information about the user. This feature has been designed to help you quickly solve login issues that may come up while working the app support desk.For example, if you search for an account, this tool may pass back that the attendee is not a member or has not registered for the conference. The user profile editor has been re-designed to align with profile editors that are rolling out in other products, such as the Scorecard, and will soon be available in the app!You will be able to quickly adjust registration codes, account unlock codes, and access QR codes that users can use to login to the mobile app. All fields will include helpful tips to educate you, specifically for fields that may not be intuitive to understand.The last section, Custom Fields, available for only pro apps, can be used to organize your attendees into specific groups. Two template emails now exist within the refined Communication Module: container app introduction or the eventScribe app introduction. Simply select the email from the Templates bucket, copy to draft, make any necessary adjustments, choose the distribution list and send it off! The scavenger hunt icons for questions no longer have image spec requirements.The app has been re-designed to adjust any uploaded image file and adjust it appropriately to display next to the question. This opens the ability for your exhibitor to submit the images, or upload the exhibitor logos, without worry of necessary resizing. eventScribe Mobile App: Jumping to Right Now! Using the Browse by Day feature, the schedule will update accordingly for the time you are looking at that particular day. For example, the screenshot shows what the schedule will look like after the user selected Thursday at 10:30am. Request a demo to learn how you can use these features for your conferences and events. 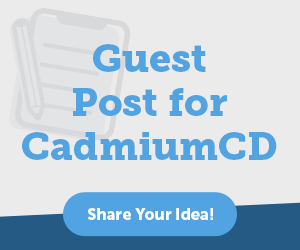 CadmiumCD has a full product line with flexible pricing options to collect, manage, and share content, organize stakeholders, and plan your conferences on one platform. 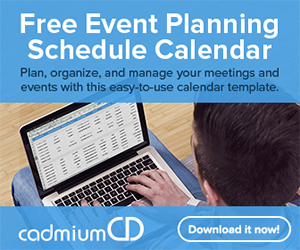 Explore case studies and check the feature release history to see how you can bring your events together with CadmiumCD.